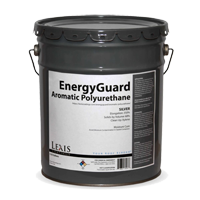 EnergyGuard® Aromatic Polyurethane Elastomeric Roof Coating is a single component, moisture cure polyurethane roof coating for all types of roofs. Built Up Roofing(BUR), Concrete Roofs, Metal Roofs, Modified Bitumen, Polyurethane Foam, Single Ply Roofing (PVC, TPO). Provides a seamless, durable membrane. High Tensile Strength and Elongation properties. Excellent UV protection for polyurethane foam. Prevents premature roof failure by controlling thermal cycling. Additional product information is available from EPDM Coatings. This product data sheet conforms to the editorial style prescribed by The Construction Specifications Institute. The manufacturer is responsible for technical accuracy. Coverage 1gal/100SF yields 10.88 dry mils. Up to 1.5gal/100SF per coat. 2 coats, 25 - 30 dry mils recommended. Warning: Aromatic Polyurethane Roof Coating contains Xylene, VM & P Naptha. Keep away from open flame, heat or sparks. Use only in ventilated areas and provide mechanical ventilation in enclosed spaces. Avoid breathing vapor or mist. Approved (MESA/NIOSH) chemical respirator and protective clothing must be used at all times. Fresh air hose masks required for interior applications. EPDM Coatings must be completely dry before exposing to water or foot traffic. Keep EPDM Coatings containers covered when not in use. Dispose of all containers in accordance with state and local environmental regulations. Keep away from children. If ingested, DO NOT induce vomiting. Call Physician immediately. Product information contained herein are presented in good faith and believed to be reliable. They do not constitute part of our terms and conditions of sale. It is also not a guarantee, either expressed or implied, that the data are correct or that products described are merchantable or fit for a particular purpose as methods of use are beyond our control. Product must be stored in climate control area and shelf life is 9 months from the date of purchase. Customer should determine the suitability of our materials and installation recommendations before usage. 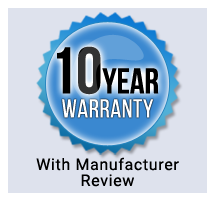 Manufacturer's sole responsibility shall be to replace that portion of any product that proved to be defective. Aromatic Polyurethane Roof Coating is ready to use. Thinning is not recommended. Spray: Airless Sprayer , 1gpm, 3,000 psi, .025 or .031 tip. Aromatic Polyurethane Roof Coating is available directly from EPDM Coatings. Contact EPDM Coatings for referral to a local Sales Representative or visit our website. Pricing information can be obtained from EPDM Sales Representatives. 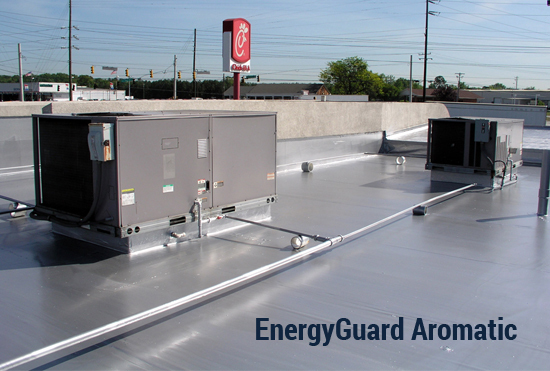 Periodic maintenance of EPDM Roof Restoration System ensures extended service life and maintains reflectivity. Contact EPDM Coatings for Technical Support. Additional information, product literature, brochures, and specifications are available.